As far as uses for forks go, this one has to be the most original we’ve ever seen. Apart from being used to fish food from your plate, a fork can be used to mix things, scramble food, poke people, dig in the dirt, get something out of a fire or be used as part of a modern art piece. It can also be used to lock doors. We’re not sure that using a fork as a form of protection is a good idea at all so we’re not suggesting that you stand guard with the thing in your hand like a Beefeater at the Tower of London. What we’re suggesting, as you’ll see from the image, is that a fork that’s bent correctly can be used to fasten a door temporarily. 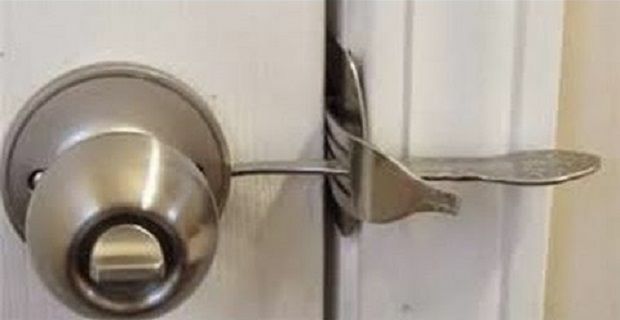 The only application we can think of for this is when you’re travelling and want to secure the door from the chambermaid so let’s assume that’s what you’re considering doing because this won’t work as a permanent solution to your door lock issues. This lock won’t prevent a forced entry so don’t worry if your kids see this and decide to lock themselves into their rooms. All it will do is prevent an unwanted accidental guest from entering at the wrong time. Perhaps it’ll give you enough time to stop whatever you’re doing. Getting the right fork does most of the job for you. Ideally the prongs should be around 2 inches in length. It’s also helpful if the handle tappers in the middle. To make the fork into a lock, begin by putting it into the latch hole. Use a felt pen to mark the fork prongs at the point in which they show which will show you how much of the prongs is covered by the latch hole. Now you need to put the fork into a vice upside down with the marks on the prongs lining up with the top of the vice. You’ll now need a hammer to bend the wrongs at a 90 degree angle. Be careful to make sure they don’t break. Now you put the handle into the vice and using a saw cut it off so there’s very little handle left attached to the prongs. Okay, there’s a lot of work to get this thing ready but when it’s done making it work as a lock is easy. You put the prongs into the latch hole using the pieces you bent. Now you shut the door. Now you use the handle you cut off and slid it between the prongs as per the image. Now you’re done.